Offering you a complete choice of products which include tmt-bar straightening machine. Scrap bar Straightening is Characterized by advanced design with safe, reliable and easy operation as well as stable performance. Easy to adjust for rolling Steel bars in different specifications. Durable, Cost Effect and Reliable. 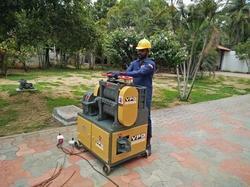 Looking for “TMT-Bar Straightening Machine”?